However smart your smartphone is, maybe booming with a lot of specifications and speed, but this is always a general tendency of any android phone to have its speed and efficiency affected adversely because of the unnecessary background tasks, i.e., applications that were opened and used but not closed completely. For obtaining the most out of your phone, these background tasks and unessential processes are better to be closed. There come a lot of great apps on Play Store that serves the purpose for you. 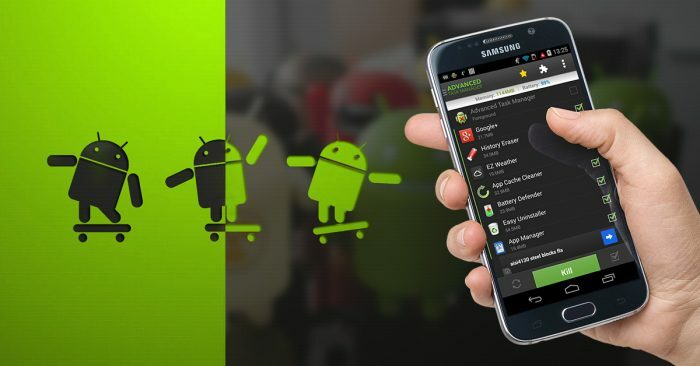 We picked a list of Top 12 Task managers for your Android Phones which will help you to decide which one to download for your smartphone. This is one of the most efficient apps for managing tasks on your phone. It not only terminates the selected unwanted tasks but also serves other purposes. It can work as an antivirus, can be used as an easy uninstaller, and also boosts your phone memory. In short, it is that very medipack your android phone requires. The Task Manager app is another task terminator that is performing very well in the market. Why this app so unique is because of its constant monitoring of the inactive tasks that lead to the slow performance of your device. It kills such tasks that are not active anymore but still keep the resources of the device busy. To the relief of busy users, this app will keep a check on unwanted tasks automatically even when the screen is off. This means that you need not select inactive tasks to kill, all you have to do is to install Task Manager. Who does not need a clutter-free device? This app is a tool to remove unnecessary files that are not needed anymore. Moreover, this app will also kill all the unnecessary applications running in the background by just one touch. Not only this, System Panel App also monitors your overall battery usage. This another great app that is freely available on the Play Store and works marvelously for all users. It is more of an application management program. It offers to the user, the advantages of backup storage of their device, ability to view CPU as well as RAM usage info and hence, monitoring of the system becomes easier than ever before. The Watchdog app is not actually the killer of all inactive apps with one click. It is a monitoring app for the phone. It keeps an eye on the functioning of the device’s processor and alerts when an app malfunctions or a service gets corrupted. Hence, the out of control apps can be stopped with no effect on other running operations. In the paid version for $2.99, you get to use full features of this app, including blacklisting an app. 40,000,000+ satisfied users are using GO Cleaner & Task Manager. Other than its one-click facility to kill running tasks and free memory, you can delete private records of your online and offline activity, such as browsing data, search records, call logs, etc. all within the app itself. You can clean cache to speed up your device and also clear APK rubbish to release more space for your phone. The Advanced task manager not only speeds up your device as a task cleaner but also saves battery life and frees up the precious RAM as well as ROM storage space. This app also provides a one-touch widget to kill tasks instantly. Super Task Killer claims to be the “fastest & simplest task killer on Google Play.” It is unique in itself because it has an installation package smaller than just 2MB. This means that it takes a very tiny amount of space on your device. Also, it is very light on your battery. With it’s easy to use interface, over 10 million users are using Super Task Killer – Fast Booster to make their device work fluidly. This one is a fully fledged package that saves battery, cleans and frees memory, acts as uninstaller, speeds up the phone’s processing and obviously, kills unwanted tasks. You can also create a list of exceptions, i.e. those apps that should be avoided to be killed. ES Task Manager can be integrated into ES File Explorer too. 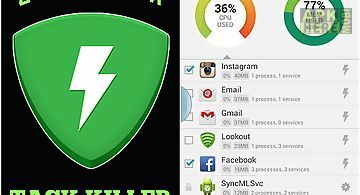 Developed by Lookout Mobile Security Zapper Task Killer offers the user some very easy ways. The distinctive feature of Zapper Task Killer is that it helps you to find the real culprit behind the battery drain of your battery.Also, Slower phone performance by showing you a list of every active app on your phone, where apps are sorted by CPU usage, with those that are using the most processing power at the top. The user can himself see which apps are the reasons behind slowing down the device. Its description very truly states, “It has been designed for even beginners of an intelligent-phone to handle intuitively!” This task killer is an app every simplicity lover should install. 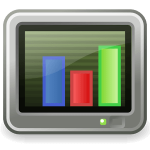 It’s easy to use interface provides a quick access to termination of tasks, uninstall pane of applications, the ratio of CPU occupation, available memory, battery usage and more. 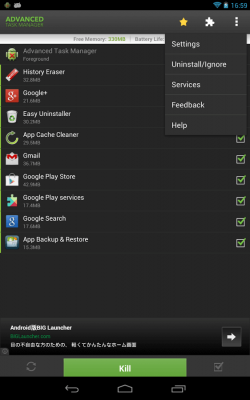 Its complete uninstaller removes all traces of an unwanted app from your device. This task manager has a clean and compact view with a swift user interface. With a hassle-free swipe to kill action like ICS and WhiteList to filter apps, this app is no less than other great task killers out there. It offers an additional “screenshot” feature too. Features like click and kill all widget and auto kill are also available but in the premium version. 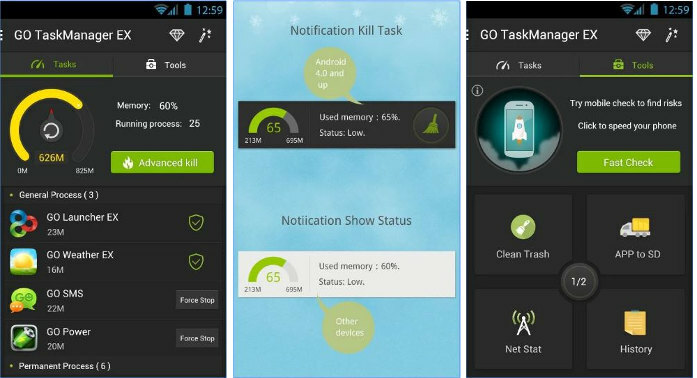 ES Task Manager – Android App Review – Manage Your Android Performance !!! 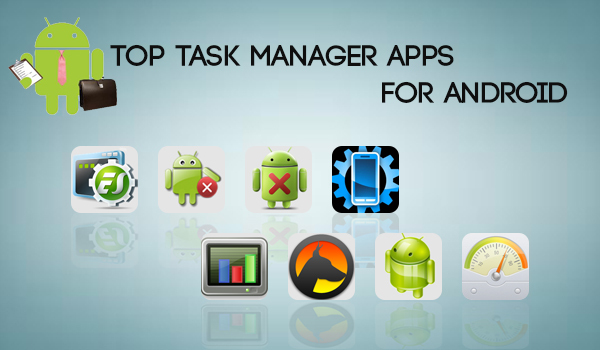 We hope that our article on Top 12 Task managers for your Android Phones will help you to speed up your device’s performance and now your mobile phone will not hang while you are doing any work. If you liked this article please share it with others on Facebook or Twitter.